Nadia and I began the project of returning all the refundable cans and bottles from day sails. We each walked two garbage bags full up to the grocery store and fed them into the self-serve machine which we managed to jam a number of times before finishing. On one of the nice weather days we had a BBQ quayside. It was a great night to sit outside and enjoy a meal in the fresh air. I went back to the library and got out a couple more books. Not sure if I'll like them both but the beauty of the library is of course that if I don't like them I just return them! 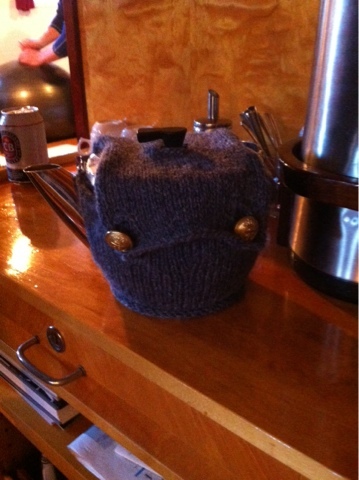 I added a top to the tea cozy I knit a few weeks back and am now considering starting a sweater after noticing a deal running at local craft store where you could get the yarn and pattern for a sweater for 299NOK (about $45). One thing I love about Kristiansand is there are about 4 or 5 stores selling yarn and knitting supplies within easy walking distance of the ship. 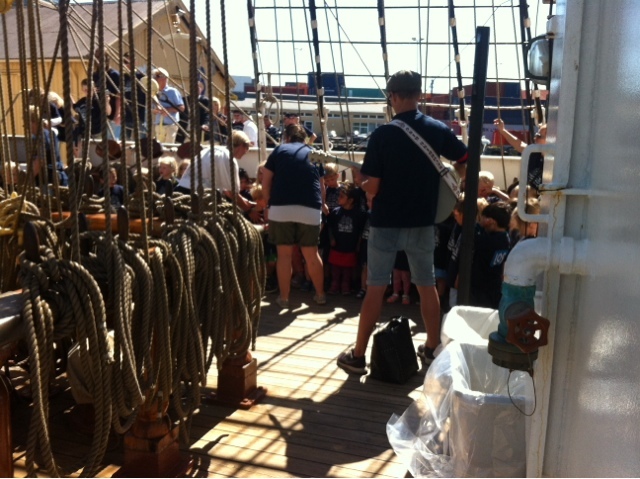 One of our arrangements started with the Jr Sorlandet Shanty Choir singing a few songs. Well I didn't realise quite how Jr they were going to be - they turned out to be preschool/kindergarten age! They did really well and clearly enjoyed the song where they got to "haul" on a rope. There were a few days with no arrangements this week and we used that time to do some organising and preparing. A few crew changes and additions this week. We're up to 20 now and more to come this next week before we leave for Tall Ships Festivals. And of course some things stay the same: beautiful fjords, shrimp to peel, runs to go on, letters to write, etc.